Home/First Aid Training/What happens in a stroke? 2) There can be a rupture or leak in the brains blood vessels. In both cases, parts of the brain stop receiving oxygenated blood and key nutrients, increasing the risk of brain damage. A blocked artery in the brain, called an ischemic stroke, is the most common cause of a stroke. This blockage can occur from a blood clot (embolitic), or from a build-up of plaques (thrombolytic) in the blood vessels. Stroke from bleeding in the brain, called a hemorrhagic stroke, occurs from either burst aneurysm or from a malformation of the brains blood vessels. 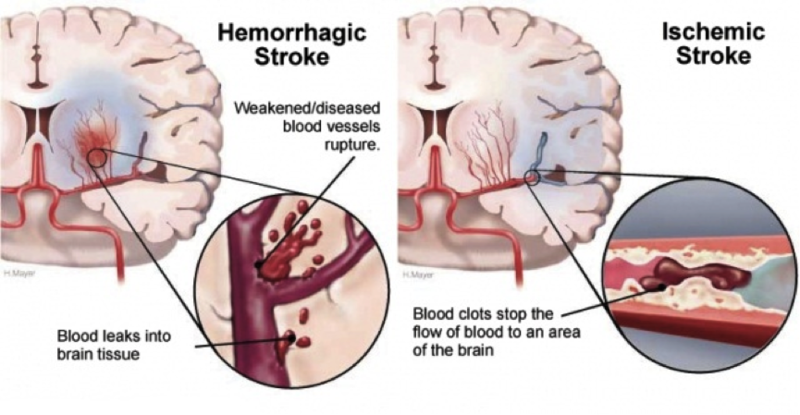 Most common causes of the hemorrhagic strokes occur from high blood pressure or trauma. How do we recognise a stroke (and what do we do to help)? The stroke fou ndation want us to remember….Think FAST and act FAST. FACE – Is the person’s face droopy or lop-sided? Check their face. ARMS – Do they have weakness on one side? Get the person to lift both arms. SPEECH – Do they slur their words? Do they understand you? Ask them a specific question that needs a specific answer, such as what day is it? TIME – Time is critical. If you suspect the person is having a stroke call 000 immediately. A person does not need to have all the symptoms for you to be concerned, in fact some people who have a stroke may experience slightly different symptoms, such as dizziness, blurred vision, or severe headaches. Again, if you suspect the person is experiencing a stroke call 000. Why is TIME critical? The longer stroke progresses, the greater chance of brain damage. The sooner we can resolve the issue, the more likely we are to reduce this probability. There is an exceptional drug that can be given to those who are experiencing a stroke due to a blood clot (ischemic stroke). This drug – known as a tPA or tissue plasminogen activator – breaks up the clot but needs to be given within 4 ½ hours of the stroke occurring. Critically, it can only be given once the cause of the stroke has been confirmed as a clot – via a brain (CT) scan. If it has been longer than 4 ½ hours, or if the problem is hemorrhagic, the person may need surgery. Once treatment has been given and the cause the stroke is resolved, the person may need ongoing support to regain lost skills and manage any emotional difficulties. And the first 3 minutes of this clip is also worth viewing.